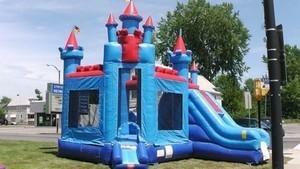 The NEW ROYAL CASTLE Combo features a large bounce area, climbing wall and 8’ Slide. The flag bearing castle spires reach 17’ into the air creating a larger than life Castle experience for your party or event. This is an excellent choice for your kids birthday party. Give your party guests the royal treatment when you rent the Royal Castle Combo. The castle bouncer brings to mind images of princes and princesses, flame-breathing dragons and magical unicorns, knights in shining armor and medieval times. Build your kid party around those themes! All kids love this inflatable. We have delivered this bounce house to all ages. From 2-year old birthday parties to 12-year old baseball team parties. reserve this combo for your next party!